On Sunday, August 13, the people at The First U.P. 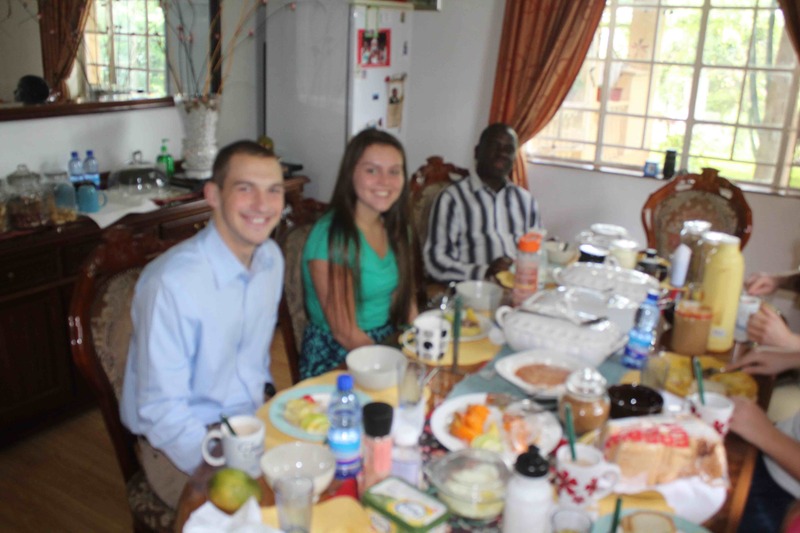 Church of Crafton Heights commissioned Lauren Mack for a year of mission service teaching in Malawi, Central Africa. Our scriptures for the day were Psalm 62:5-8 and Ephesians 3:14-21. As I begin the message, I am curious as to what we are actually doing here this morning. We are “commissioning” Lauren. We are sending her off. Why? What for? 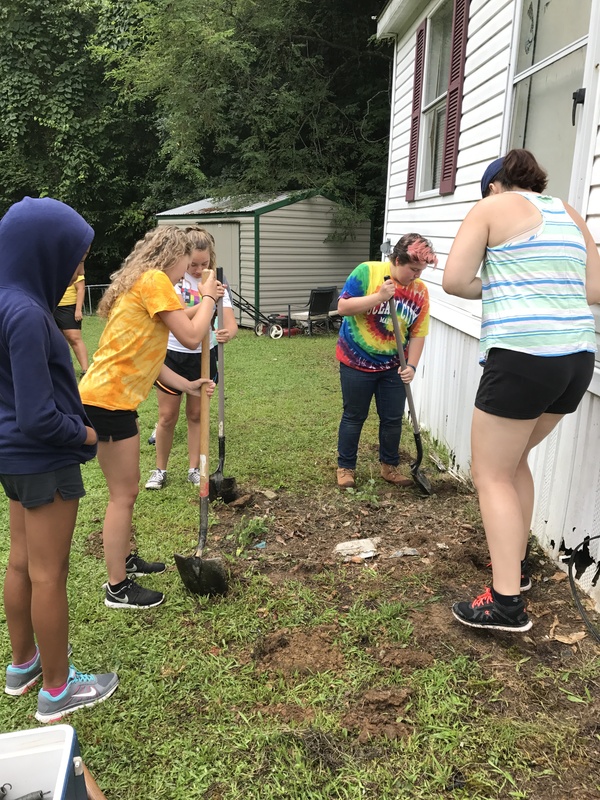 What are our hopes for Lauren Alaina Mack as she leaves Pennsylvania and heads to the Central African nation of Malawi, where she will spend a year teaching at the St. Andrews’ Mission Secondary School? In each pew, you’ll find a pencil and some paper. Take a few moments now and just jot down your hopes for Lauren, and, if you know her, Brooke Merry in the next 12 months. What are your prayers for them? What do you hope will happen in their lives? Now, think about the kinds of things you wrote down. What do you hope for? I want you to hold onto those cards for a moment as we continue. As I thought about this service, and this message, and the scriptures at hand, I thought about my prayers for these two beautiful young people. 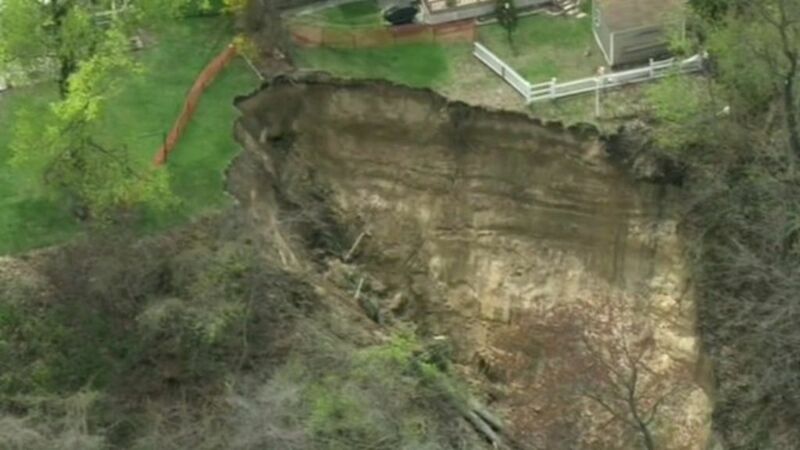 Almost instinctively, I am praying that God would keep them SAFE. 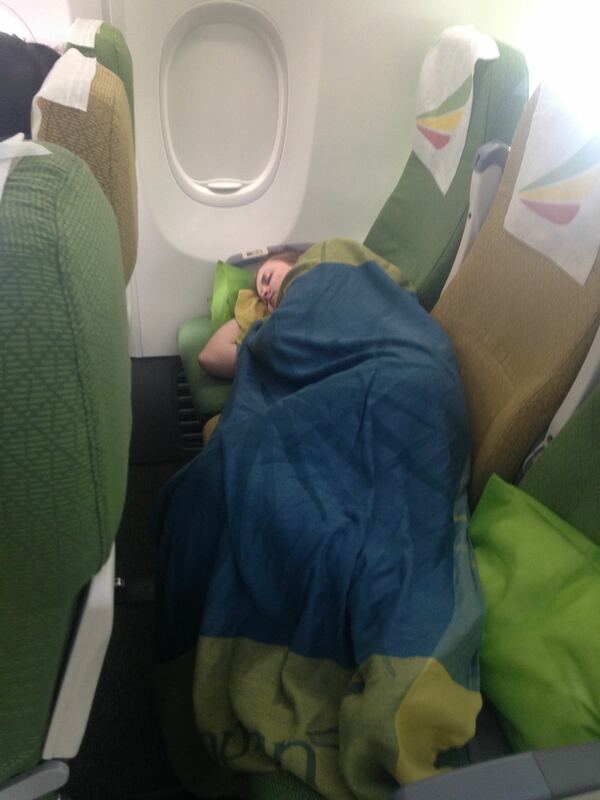 I’m praying that they’ll have a good time in Malawi. I’m praying that they’ll do a good job at the St. Andrew’s Missionary Secondary School, and that the kids will know more about English, and life skills, and Jesus when Lauren and Brooke get through with them…I pray that they will make a difference in Africa, and that Africa will make a difference in them. Paul had known the Ephesians for awhile, but not as long as I’ve known Lauren. He was praying for them as they tried to be faithful to their calling in a place that was plagued with difficulties. What does Paul pray for? He prays in verse 16 that Jesus will strengthen the Ephesians in their inner beings SO THAT those hearts would be fit places in which Christ could dwell. He prays in verse 17 – 19 that the Ephesians, who already know something about love, will continue to be shaped and molded by that love so that…so that what? So that they will be able to grasp and to know the love of God – so that in that knowing they might be filled with the very fullness of God. That Paul, he’s a sneaky one. You’ve got to keep your eye on him – I’m telling you. But Paul? This guy is a dangerous pray-er. A far more dangerous pray-er than I ever will be. Paul’s prayer is that at the end of the day, the Ephesians will end up knowing something – being filled with something, namely, the fullness of God himself. Why is that so bad? Because whereas my prayers end up at the finish line, Paul’s prayers end up at the starting line. He prays that when it’s all said and done, the people he loves will be ready for something; that they’ll be equipped for something; that they’ll be poised and filled and eager. 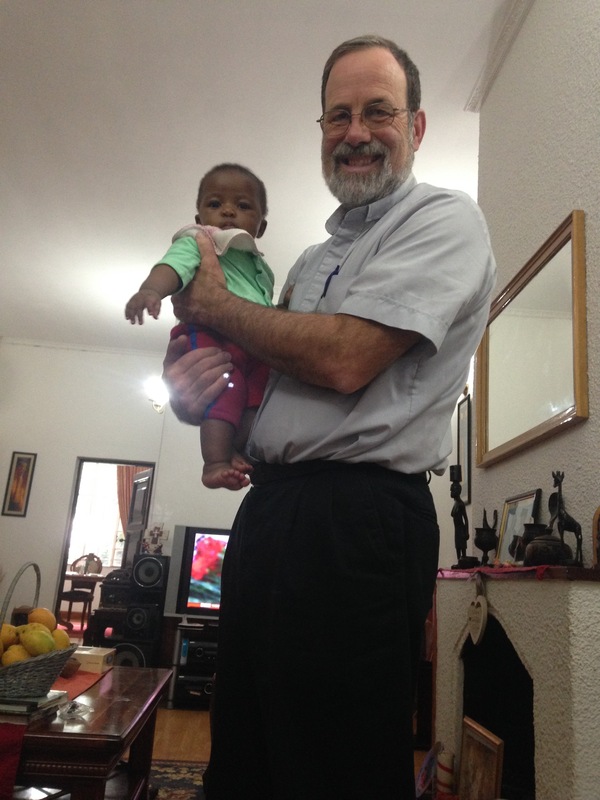 Let me tell you a little something about the church of Central Africa: Presbyterian – the partners to whom we are sending Lauren. It was founded by a group of young Scottish missionaries who had become enthralled by the stories they heard from the Rev. David Livingstone. After Livingstone’s death in Central Africa, Henry Henderson became the leader of the first mission to Malawi in 1876. He, along with the other leaders of that trip, John Bowie and Robert Cleland, were dead within fifteen years. 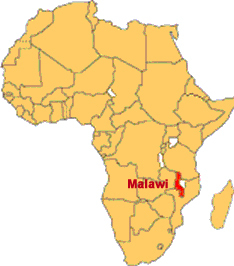 You may already know this, but the earliest missionaries from Scotland to Malawi didn’t pack their things in suitcases. They packed their things in coffins. Why? Why would they do that? Well, for starters they were just being realistic. It was dangerous. Most of them died over there, and so packing your clothes in a coffin was simply an efficient way to get everything from point A to point B. But there’s more to it than that, I think. I think that another reason why they took their coffins along was that they were pretty sure that Malawi was their last stop. They were called to go to Malawi, and they went, thinking that Malawi was where things would end up for them. Again, if that’s the case, then taking along a coffin is simply the prudent thing to do. But Lauren, you won’t be packing your gear in a coffin (although if you log onto casketxpress.com you can get a good deal!). You’ll be more likely to have Samsonite or American Tourister. Why? Because you have budgeted for a return ticket already. We have every reason to expect that you’ll be showing up at the airport a year from now and that you’ll be back in this room at that point. Many of us will plan to meet you here, in fact. So this trip of yours is really just a temporary situation. It’ll be over before you know it. The blink of an eye. Twelve months – that’s nothing – heck, I used to go that long without shaving. And that’s why my prayers are deficient. Because if I am praying for you to have accomplished something, to have been kept safe, to have arrived somewhere…then I’m only praying a twelve-month prayer. Hardly seems worth the breath, does it? But what if each one of us, every day, prayed like Paul? What if we prayed that when we all get together here and celebrate the Lord’s day when Lauren returns, we’d be ready for something bigger? That we’d be so infused with the love of God, so captivated by the presence of God, so filled with the fullness of God that it would make us about ready to burst out of our skins? What if we prayed that come August, you’ll have finished your mission work in Malawi for the year, but that each of us will be different and each of us will be equipped and receptive for God’s next call on our lives? Ah, not so fast, Carver. How can you just throw away a sentence like, “a year is nothing…” I bet that it that was your kid buying that airline ticket you’d be singing a different song. How in the world are we supposed to be able to let go of those wonderful, practical prayers that we’ve come to expect from Pastor Dave and risk the dangerous prayers of Paul? How can we be free to be ready to live like that? How can we think of ourselves as NOT marching towards a magical finish line when everything will be “back to normal”? Do you see? If it’s up to us; if I’m out there trying to protect myself, to prepare myself, to figure out where in the world I’m supposed to be, then there’s no way that I’ll ever be able to let down my guard enough to listen to the wise counsel that comes from God. But if I really believe that it all depends on God; if I really believe that there’s nothing that is going to hit me that I can’t survive with God’s help; that there’s no problem too big for God to get me through, that God has my back…then I can spend all of my energy on getting ready for being the person that God has for me to be, and I’ll trust that God will get me where he needs me when he needs me. Lauren, I have to tell you this: it’s going to be a shock when you come back from Malawi than next August. You’ll leave a community in which you will find church after church packed with joyful people who have a hunger for God that compels them to show up for worship as early as 5:45 a.m. just so they get a seat…and you’ll return to a culture where bored looking people show up in church twice a year in an attempt to win some brownie points with God, with their mothers, or who knows what other reason… You’ll leave a nation where children carry their pencil – their one pencil – back and forth to school every day as if it were gold, and come back to a flurry of “back to school” sales that will make your head spin. You may have heard me mention that I was so overwhelmed by the cultural shock of affluence and choice when I returned from my first trip to Malawi that I could not go grocery shopping. The day I got back, I ran up to Shop & Save to grab a few things, but when I got to the toilet paper aisle I was overcome with grief or sadness or something… I stood there trying to figure out which was the best deal for toilet tissue, and how I could save money, and my mind was filled with images of the people I’d left behind in Malawi – people who had real difficult choices to make, and here I was trying to figure out it if was better to get Charmin or Cottonelle… And so I left a full cart of groceries in the paper products aisle at Shop N Save because I just couldn’t cope with it. Nope, I don’t envy you coming back when you come back. And it would really stink if you went to Malawi for twelve months and then you came back in August and MY prayers were answered. Man, would THAT make for a miserable Autumn. Why? 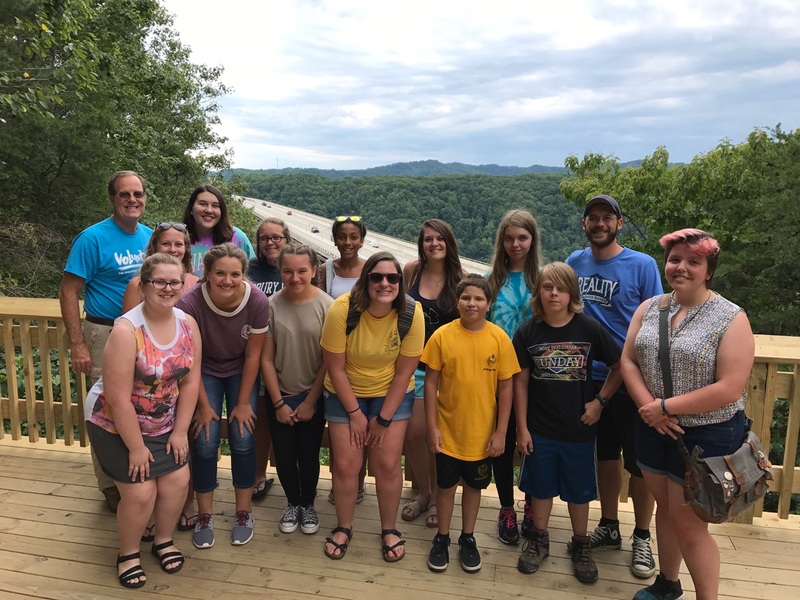 Because you’d be spending all your time thinking about all the ways that Crafton Heights isn’t Ntaja; you’ll be missing the vibrancy of that worship; heck, you’ll even miss nsima and chicken…if you got to August and thought that you were done. But what do you think would happen to you, and to us, if in the next twelve months PAUL’S prayers were answered? THEN we’d be looking forward to an incredible 2019. Why? Because your time away will have prepared you for whatever is next for you HERE. Because your time away will prepare your friends and relatives to see you in a new light and to invite you to new challenges and new opportunities and new horizons…because instead of being finished with mission, you’ll be even better prepared for it. So, Lauren, Glenn, Cheri…whose prayers are we going to lean on? 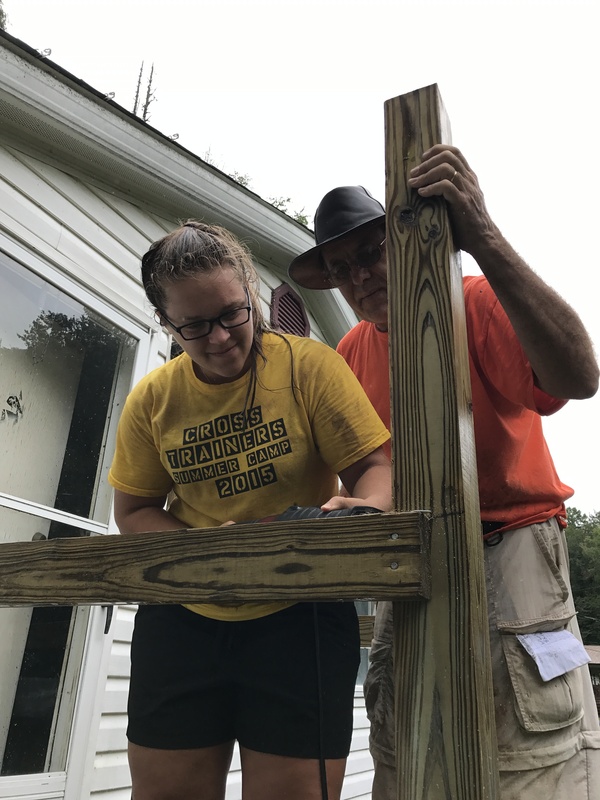 The relative safety of Pastor Dave’s “keep an eye on ‘em, OK God?” Or the outrageous risk of Paul’s “Make us all ready, God, for the work that you have for each of us”? So here’s what I want you to do…I want you to take that card on which you have written your prayers for Lauren and Brooke. And I want you to turn it over and write out “Ephesians 3:14-21” on it. And I want you to pray that prayer for Lauren. And for Brooke. And for me. And for you. Thank God for bold prayers and for those who are led into them. Thank God for the call that comes to the church. Thank God for the ability to respond – in this neighborhood, in Malawi, and in every place in between. Amen. 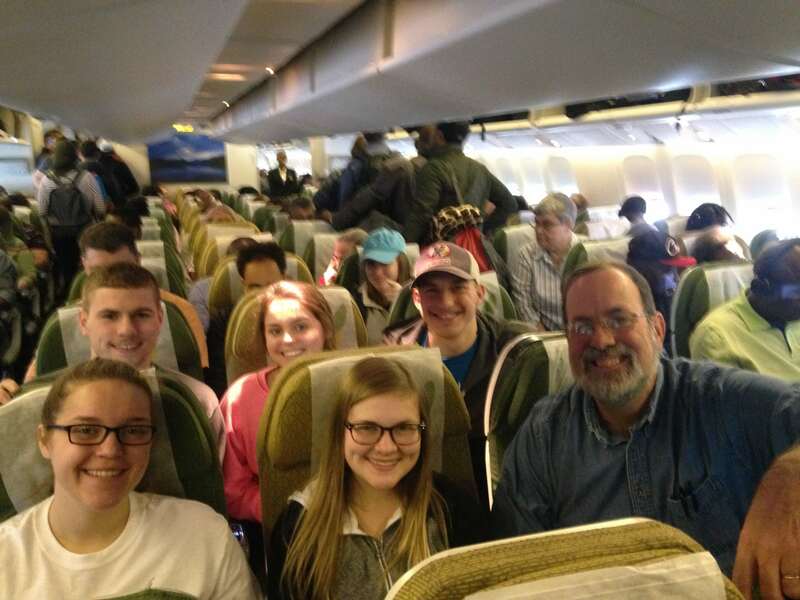 To learn more about Lauren’s trip in Malawi, or to follow her adventures, please check in with her blog. 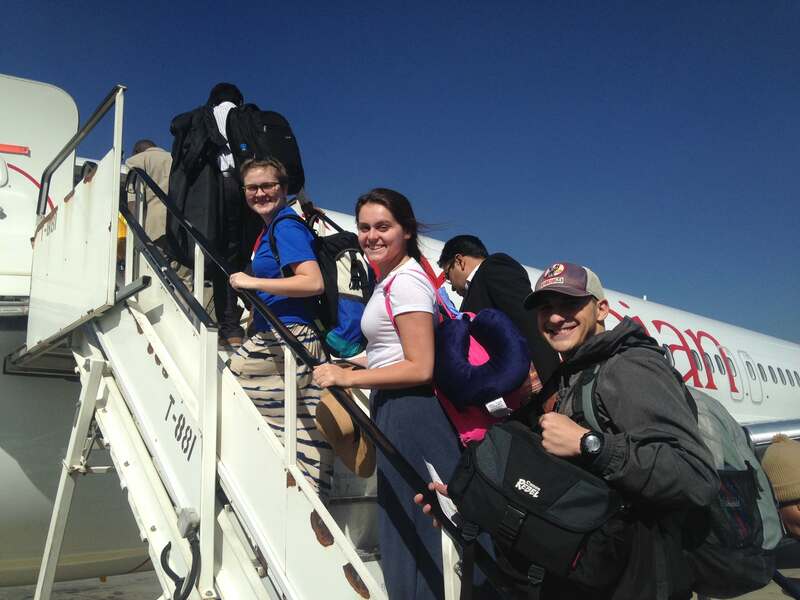 Lauren’s fellow traveler, Brooke, can be found here! 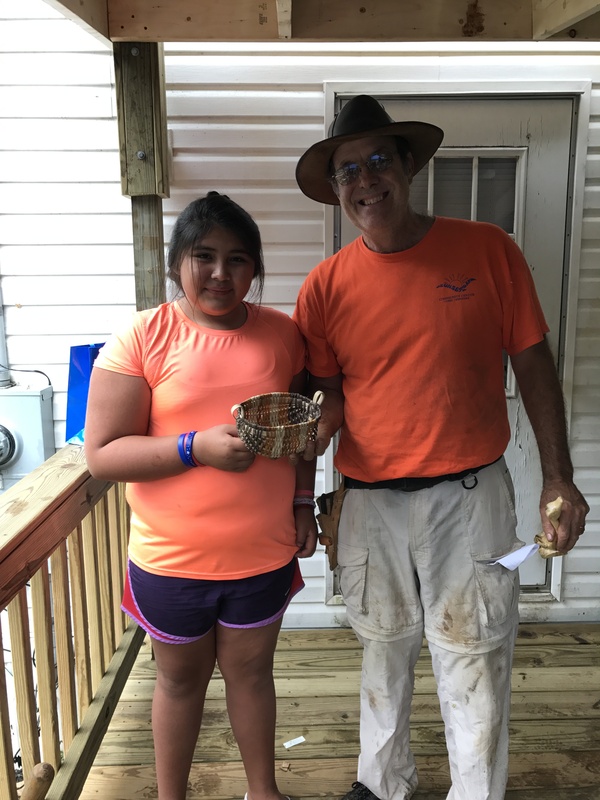 Our week of service, learning, fellowship, and fun in the Qualla Boundary of the Eastern Band of Cherokee Indians is nearly complete, and we finished strong! Evan starts the demolition of the steps. Thursday was, like most other days this week, a rainy day. 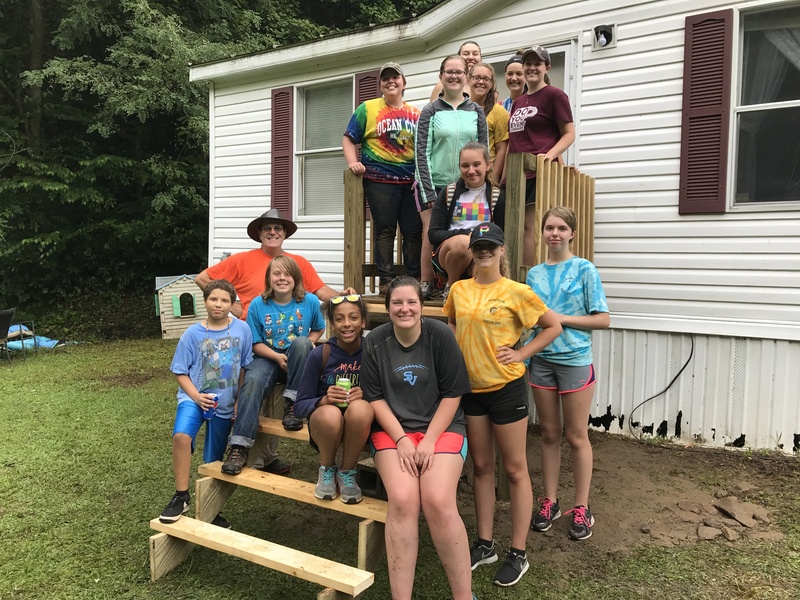 Yet this team of young people worked through the showers to dissemble a rickety set of steps on Miss Charlene’s home and install a safe, sturdy, spacious entryway for her and her family to use. Everyone did something – in fact, I can’t recall seeing more people at work on an area that was approximately 5′ x 5′ in my life! We got to be expert diggers and rock removers on this trip! 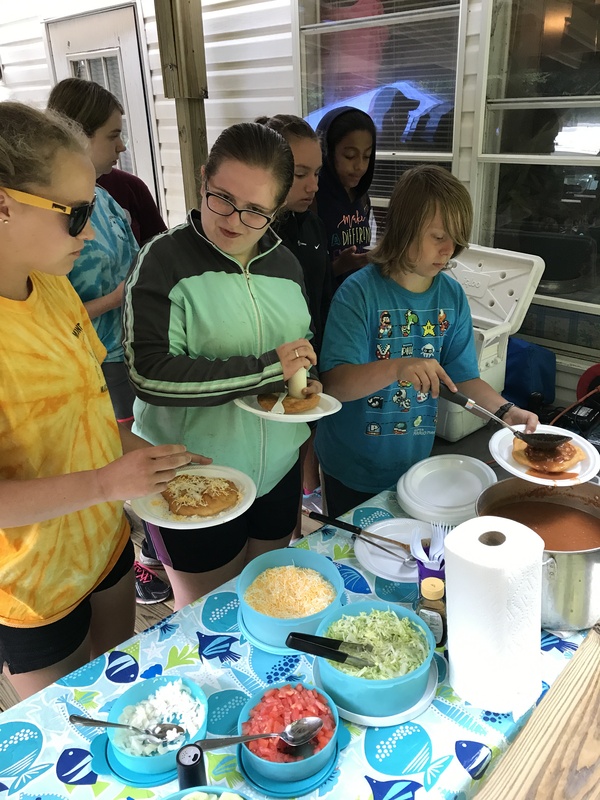 While we were hard at work outside, Miss Charlene was hard at work inside, and at lunch she treated us to an amazing meal of what she called “Cherokee Tacos” – the “shell” was a delicious fry bread, and the fillings consisted of lettuce, tomato, cheese, beef, beans, cucumbers… wow! It was delicious. 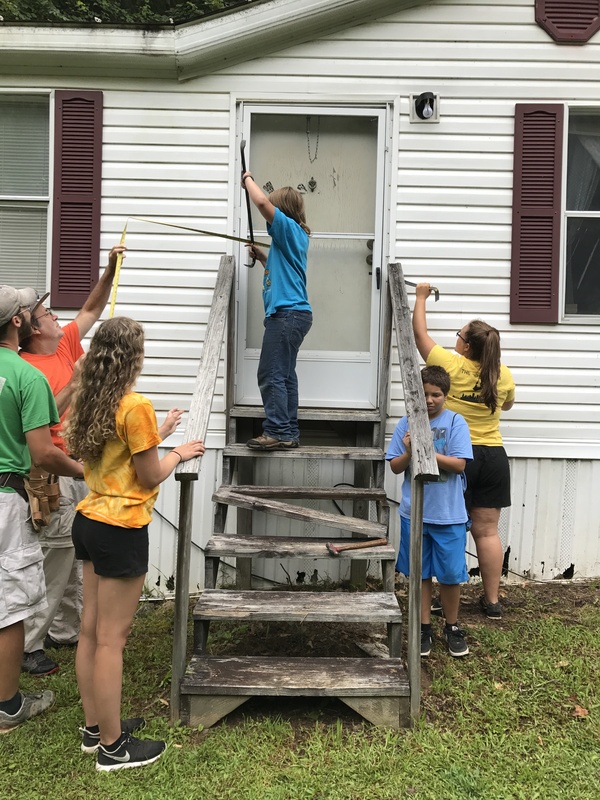 At the end of our work day we were further surprised to be called onto the porch by Miss Charlene’s children. 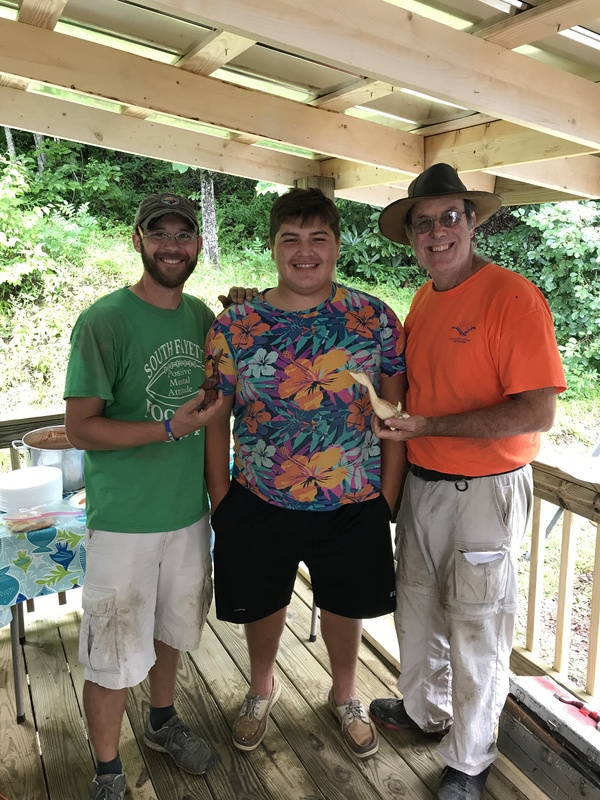 Isaiah, a high school student, presented Tim and myself with some woodcarvings on which he had been working. Catherine, his younger sister, gave the two of us hand-made baskets. 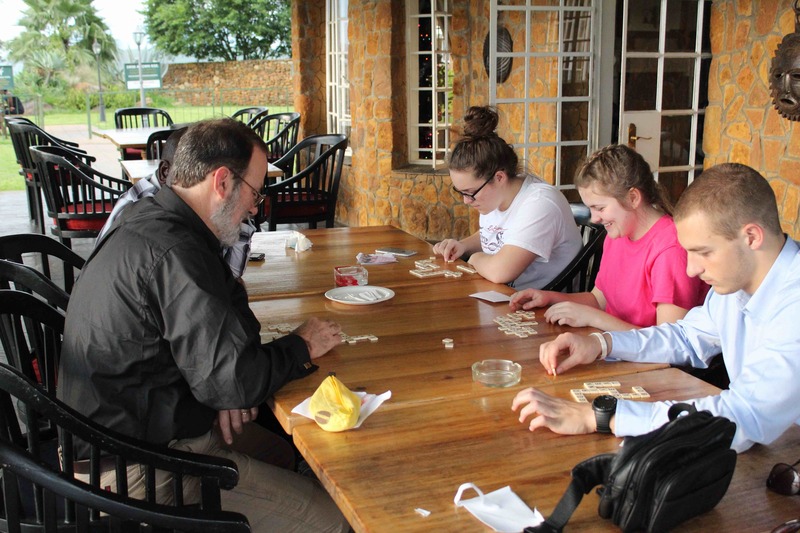 And every single participant on the trip received a handmade necklace made from glass and corn beads. 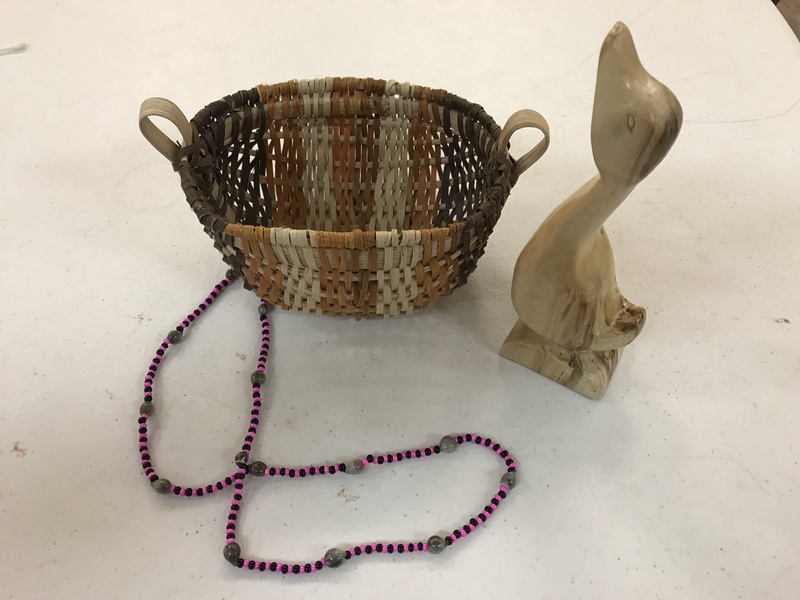 This is an especially meaningful gift given what we have learned about the corn beads. 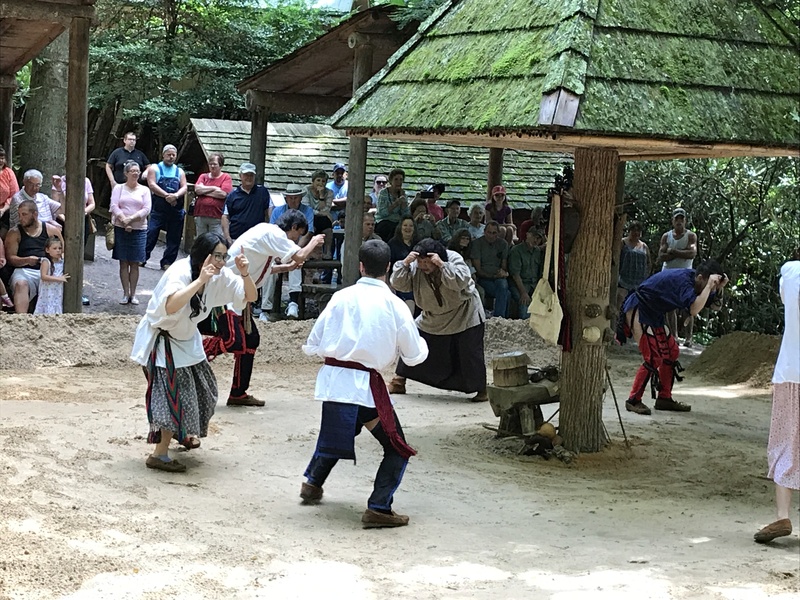 In the 1830’s, the Cherokee were rounded up from the hills of the Great Smoky Mountains and herded like cattle to the “Indian Territory” of North Carolina. This is called either “the Removal” or “The Trail of Tears”. The legend says that as they walked, their grief was so profound that as they wept, plants sprung up from their tears. The seeds of this plant look like tears and their color is that of grief. Cherokee today wear these “corn beads” in memory of the grief and horror of that time. 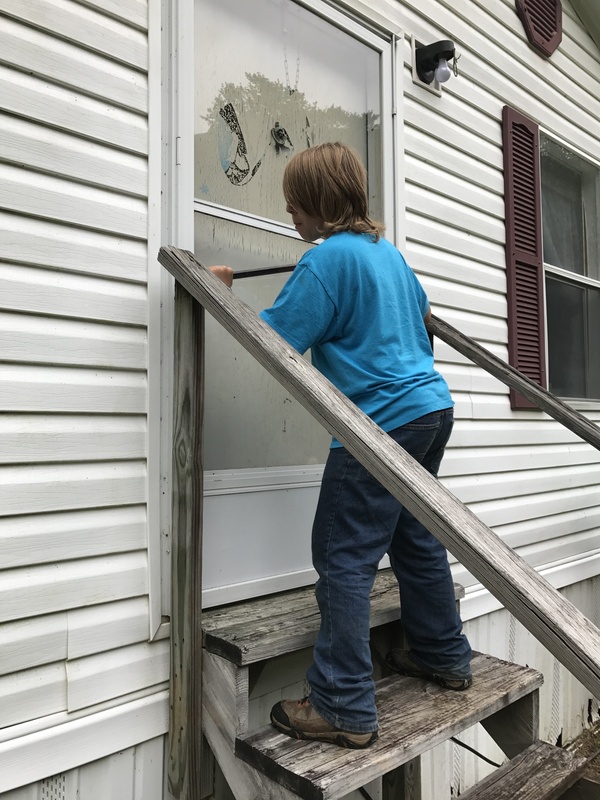 The steps – finished as far as we could with the materials available. The porch and roof we were able to construct. 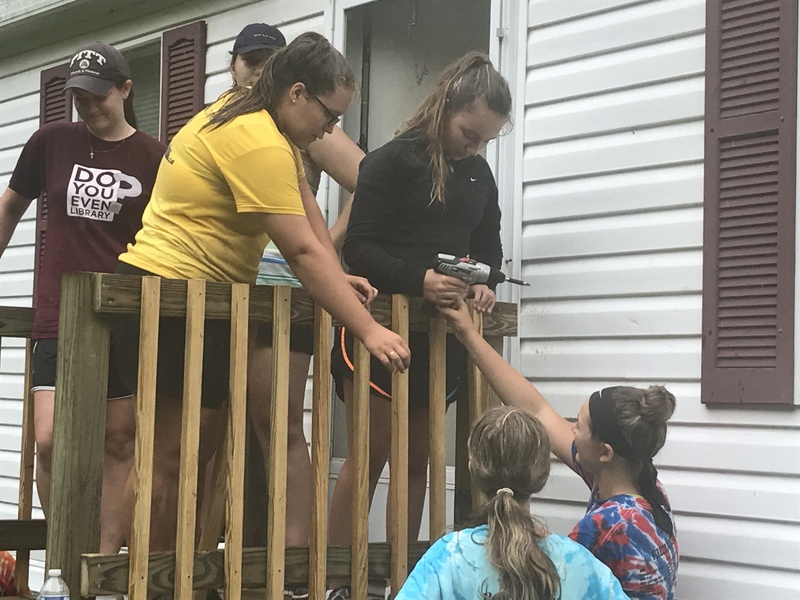 Friday is often what we call the “fun day” on a mission trip. 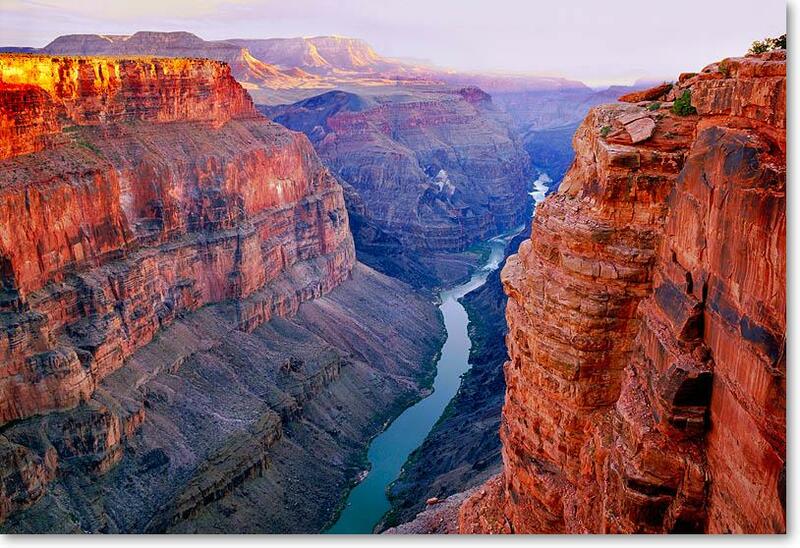 We try to take some time to learn more about the places we visit and the people who are there. This year was no exception. 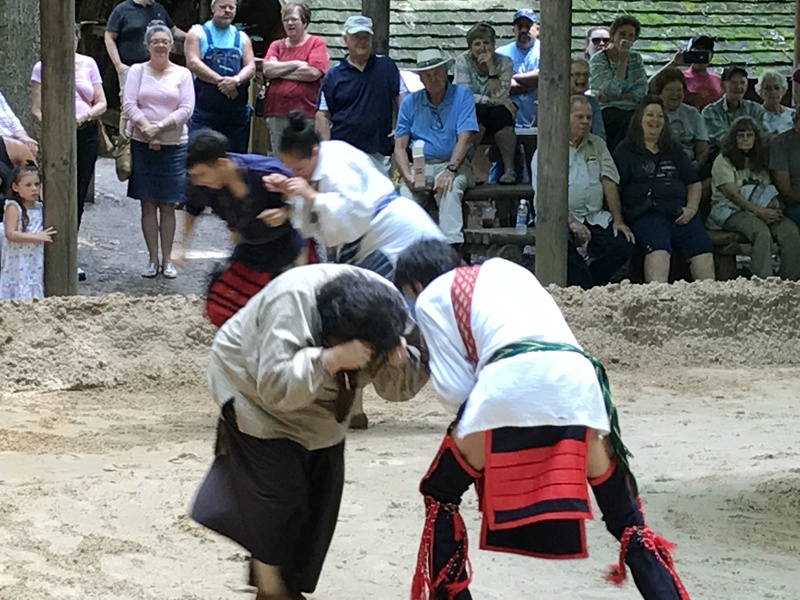 In fact, I’ve been on many trips to and through the Great Smoky Mountains, and I have never heard much mention at all of the Cherokee story. This year, that changed in a beautiful way. 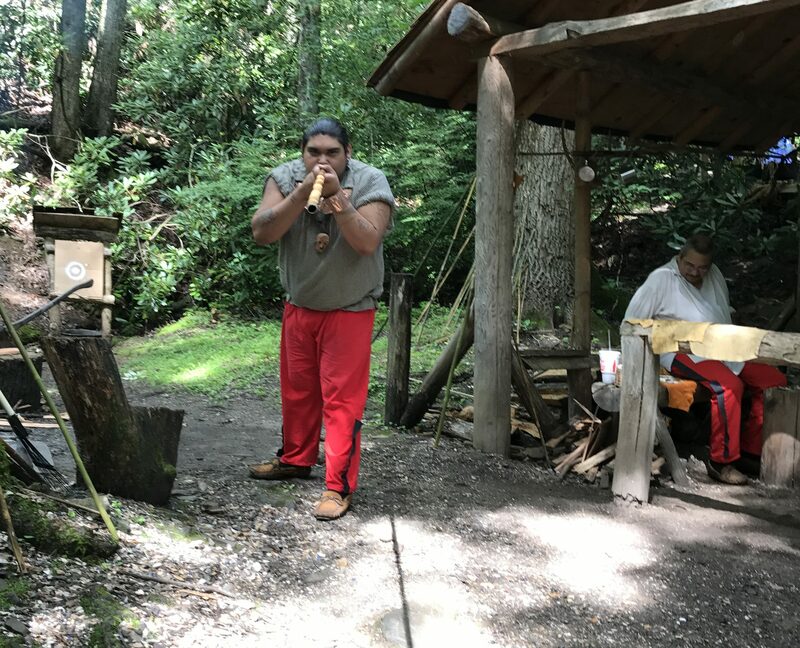 We started the day at the Ocunaluftee Indian Village, a “living museum” where re-enactors shared the Cherokee way of life before and since the Removal. 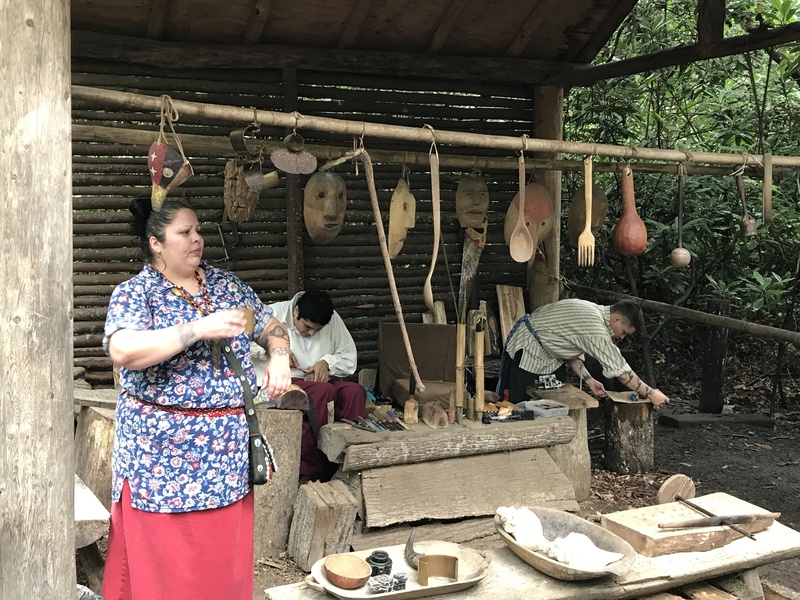 We saw demonstrations of pottery making, weaponry, stonework, and more. Our group particularly enjoyed the traditional dances, and a few of us even took part in the same. In fact, the reason that there are no photos here is that your author was among those “whooping it up”! The group was unanimous in that the time spent at the village was amongst the best things we could do. Levi gave us a demonstration of how a “blow gun” works – accurate at up to 50 feet! 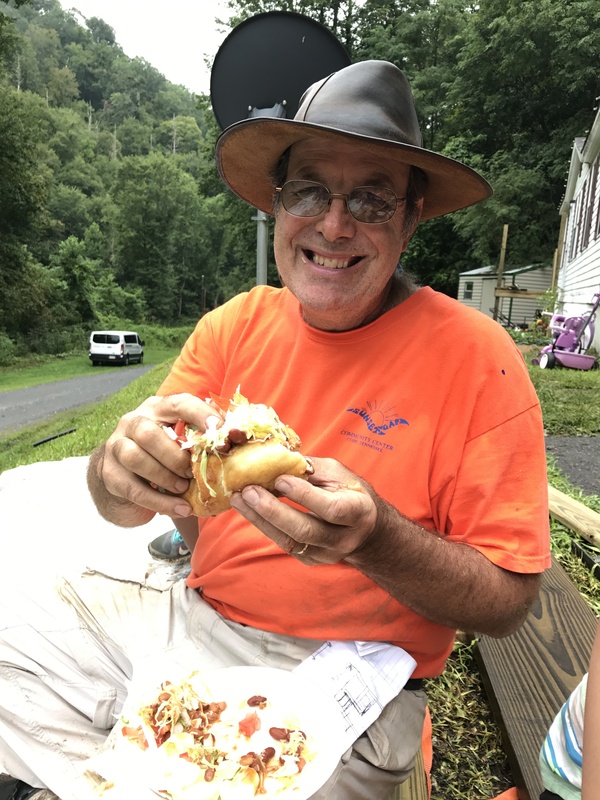 Following a quick lunch, we stepped it up a little bit in the adventure department and tried our luck tubing the Ocunaluftee River. Normally, this is a “lazy river” experience, and for much of the time, that’s what we had. 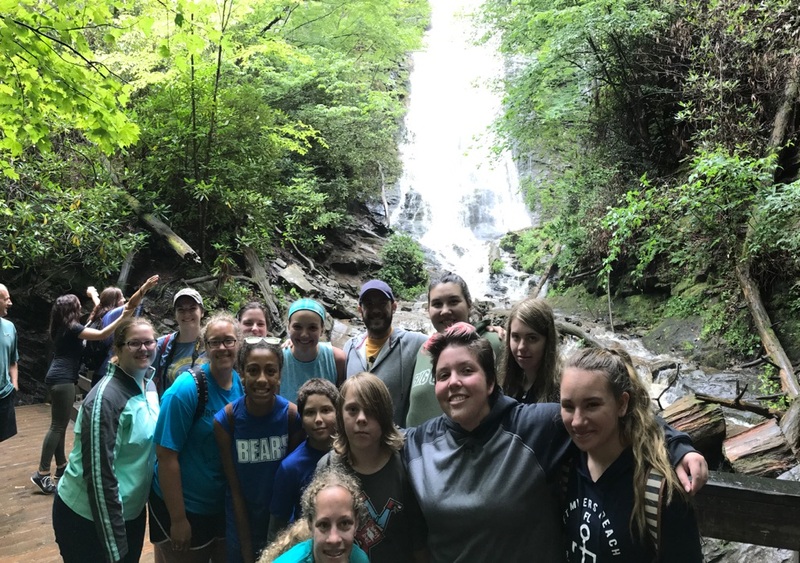 However, with all the rains this area has had recently, the waters were higher and faster than normal, and so a few of the rapids were bumpy and some of us emerged with some new aches, pains, and scars. I think that at the end of the day, however, most everyone was glad that they’d tried it – whether the took the leap from the rope swing or not. We ended our evening, and our week, with a devotion on “Wild Love” and the charge that we’ve been given to keep looking for love in the places to which we are sent. We heard from our graduating senior, Katie, and we prayed over her. Some of us might have cried… And it was good. 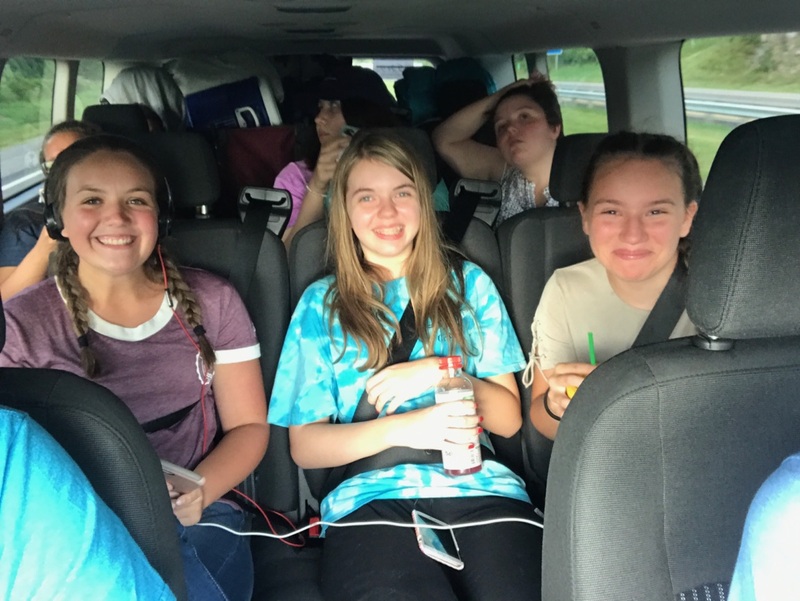 So now it’s all over but the packing and the long drive home… I’m so impressed with the ways that this group of young people has handled themselves in situations that were challenging to say the least. I can’t wait to see what God has in store for them in the years to come! The New River Gorge Bridge in West Virginia is a favorite stop on our way out of Pittsburgh. 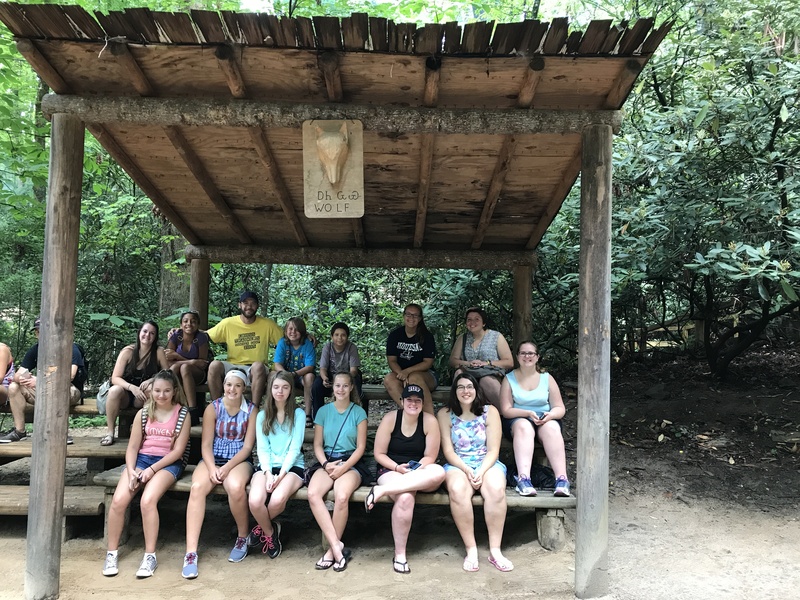 The Youth Group from the church/Open Door is spending the week at the Qualla Boundary with the Eastern Band of the Cherokee Indians. 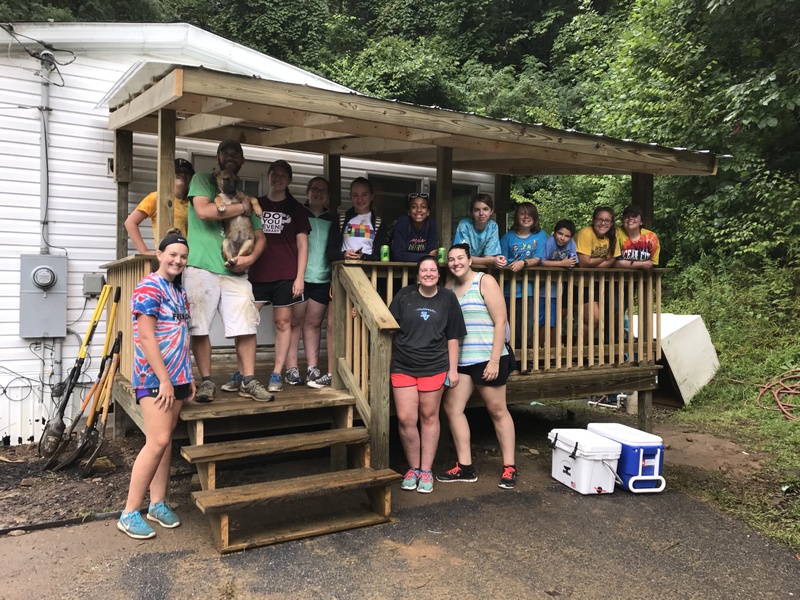 We are staying at the Cherokee United Methodist Church, and we came in order to encounter aspects of the culture, our faith, ourselves, and our world in order to learn something about being more fully God’s people in this world. To get here, we left Crafton Heights immediately after church on Sunday and drove approximately ten hours south. These smiles kept us going all day long! 521 miles! 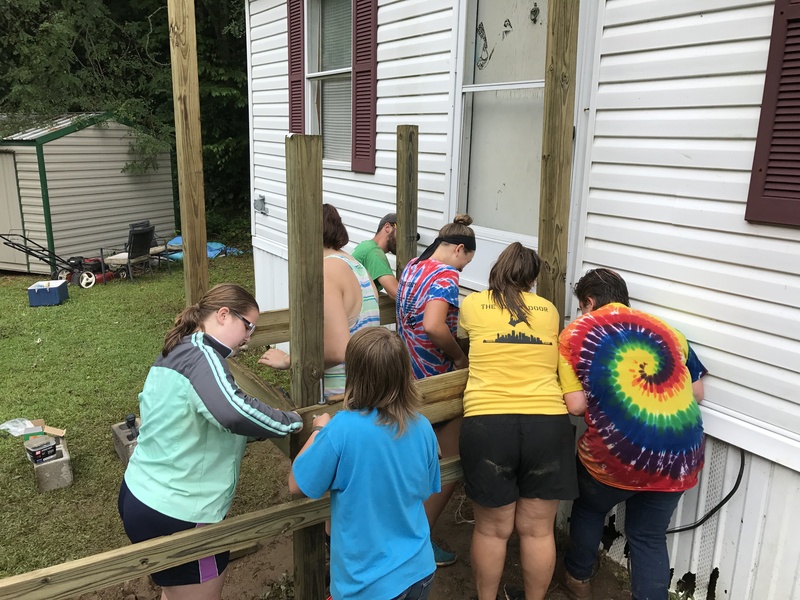 The PLAN was to spend this day laying the groundwork for the construction of a deck and porch for a family in need. However, for the first time in memory, we’ve had a day that is simply a “rain out”. Buckets and buckets of water poured across the Great Smoky Mountains, and we were forced to adapt our plan. We spent the morning wandering through the Museum of the Cherokee Indian, which contained a number of informative displays concerning the history and culture of the people who lived here when the Europeans showed up in North America. 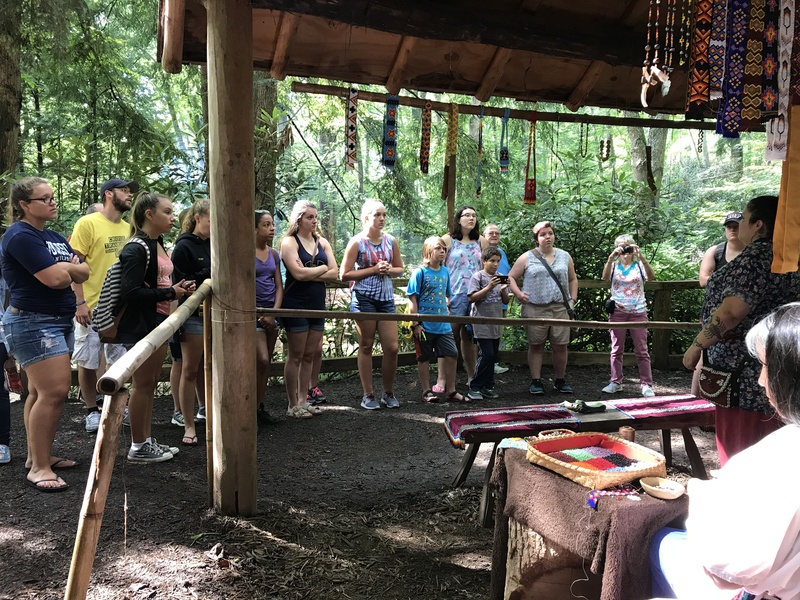 We learned about pottery, games (like stickball and lacrosse), and handicrafts; we saw something impressive about the empowerment that the Cherokee traditionally accorded to the women in their midst; and we were saddened to read of “the removal”, or the “Trail of Tears”. In fact, the church in which we’re staying is the oldest Native American congregation in the Eastern USA, and it boasted about 440 members in the year prior to the “removal”. Three years later, the church had only 40 members. We spent the afternoon, in Paige’s words, “pretending it’s a retreat: let’s get to know each other!” You might have enjoyed working a puzzle or playing Apples to Apples; I know I got a kick out of Tim doing his best Jimmy Stewart impression to a group of adolescents who have absolutely no idea who Mr. Stewart is. 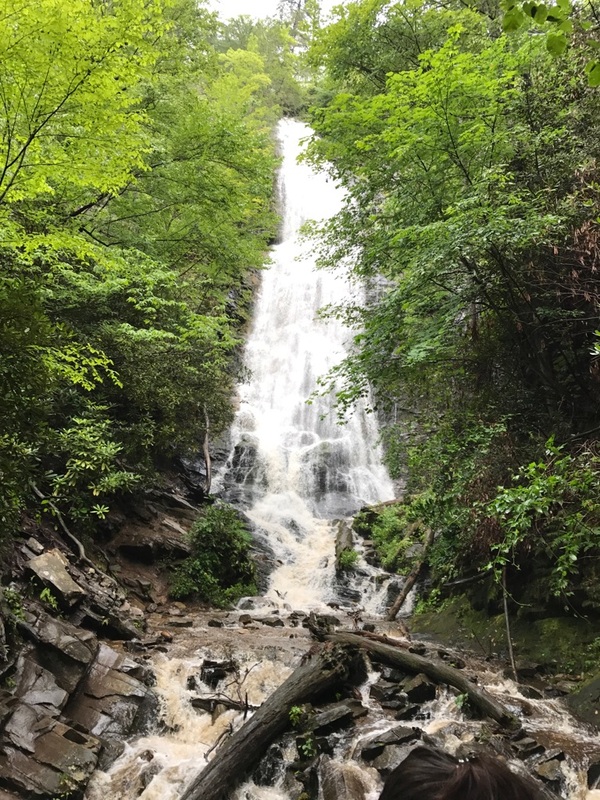 When the weather gave us a little bit of a break we took a quick trip to measure out our job site and a brief hike to the beautiful Mingo Falls. A little “Apples to Apples” on a rainy Monday! 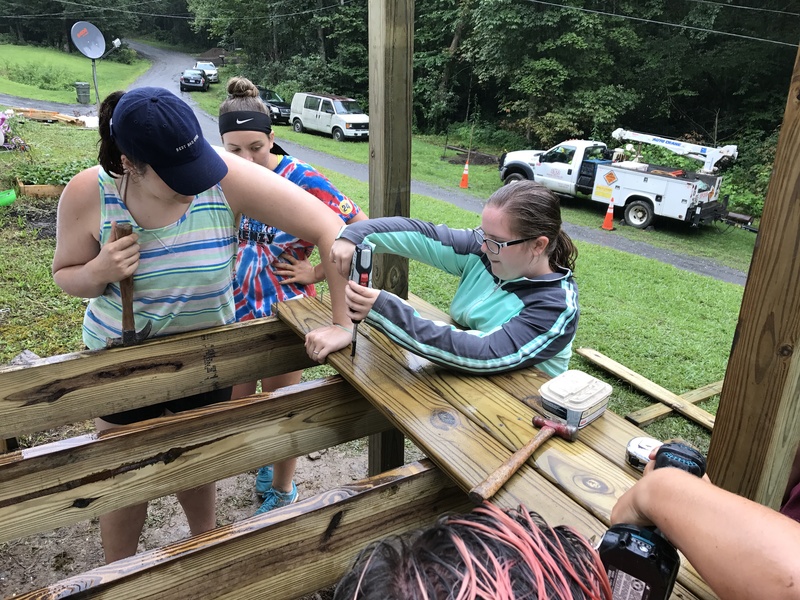 If the success of the trip is measured in how much wood gets cut or how deep the holes we dig are, well, today was a washout. But if we’re here to encounter and be encountered, well, then – today was a success. And hey – no splinters! Breakfast…”the most important meal of the day”, right? It is hard for me to believe how deeply our team was able to dive into the “Warm Heart of Africa” on their first full day in Malawi. 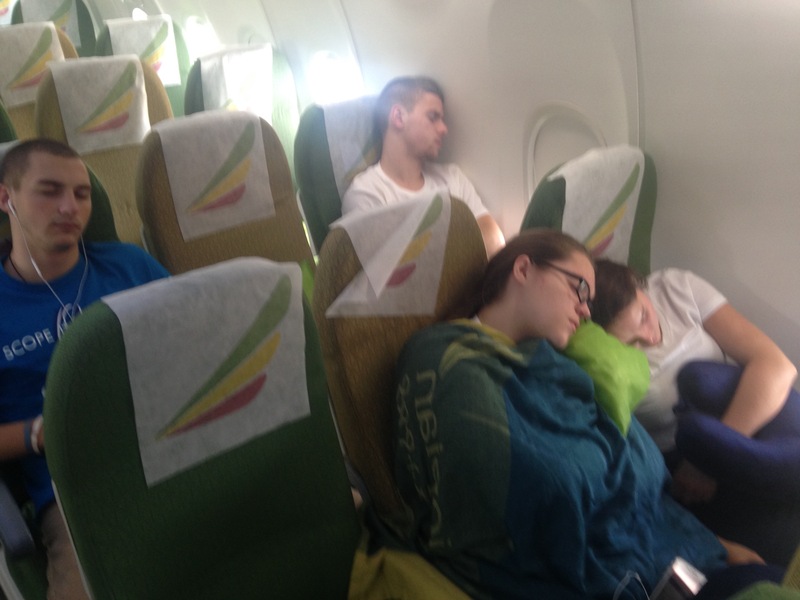 Everyone rested very well and awoke to an exquisite Malawian breakfast consisting of eggs, cereal, bread, sausage, beans, potatoes, tomatoes, fruit, juice, milk, tea… it was a bit overwhelming (but we did our best!). From there the day developed into a non-stop opportunity to engage the new-ness of this society and culture in many ways. Rose measures Katie for her new dress. Our first stop was at the home of a woman named Rose, a self-employed tailor/seamstress here in town. 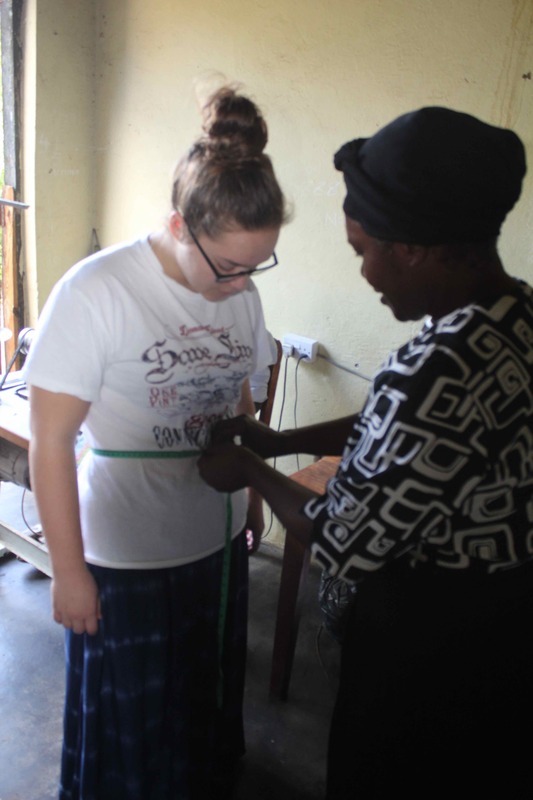 The members of this team had asked about the possibility of having some clothing made out of Malawian fabric, and Rose and her team took our measurements and told us how much fabric we’d need. Our next stop gave the team the opportunity to experience the mysteries and mathematics of the monetary exchange process. 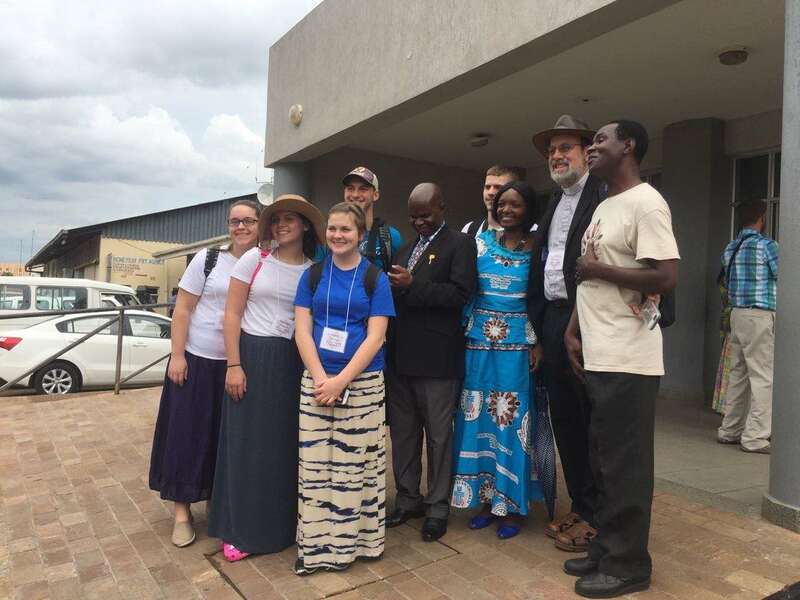 We visited several bureaus and shopped for rates until we found someone who was able to help us translate some of our US dollars into Malawian Kwacha. This is not a simple process, and while I was taking care of some of the business, the young people made their first foray into a Malawian shopping market. From there, we visited the offices of Blantyre Synod. The entire Synod staff is on holiday break, but we had the opportunity to visit the iconic St. Michael and All Angels Church and several other sites of both historic and spiritual significance. Abusa (Pastor) Mbolembole, from St. Michael’s CCAP, welcomed us into his study and we had a good discussion about some of the practices shared by vital churches in both Pittsburgh and Blantyre. 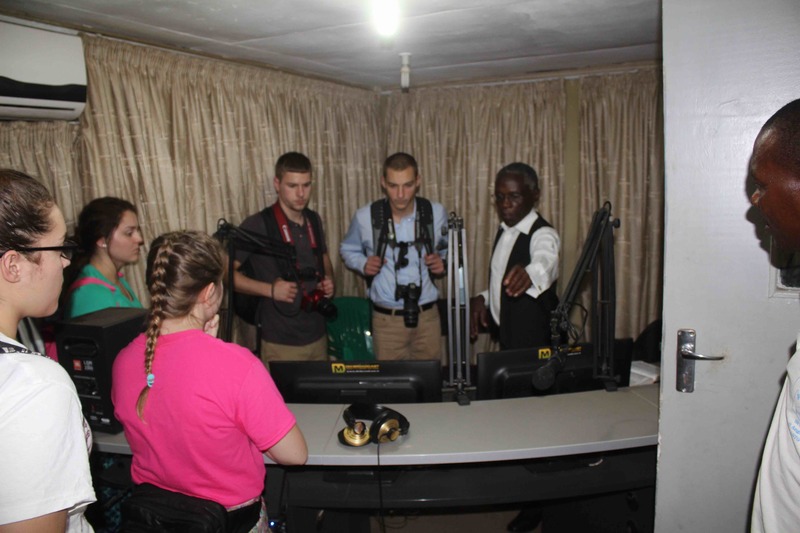 We also had the opportunity to tour the studios of the Blantyre Synod radio station, which is a fairly new ministry designed to help the entire population of Malawi encounter the Good News of hope and reconciliation in Jesus Christ. We developed an appreciation for the ways that broadcast ministries such as this can extend the possibility for meaningful relationship as we considered our own congregation’s recent experiment with live-streaming our Christmas Eve worship service – which opened the possibility of such worship to many who were unable to be physically present in worship. 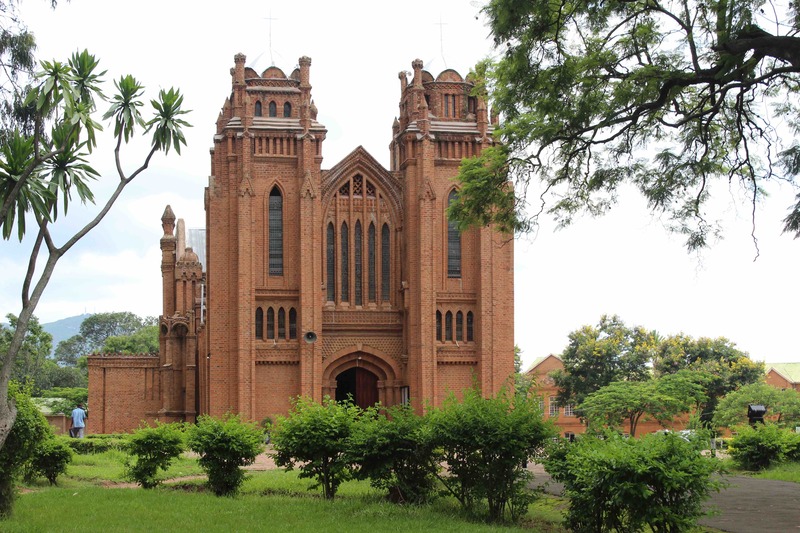 The Cathedral Church of St. Michael and All Angels. Upon awakening this morning, we were informed of the death of a friend of our host. We were honored to be asked to attend her funeral, which we did following our visit to the Synod complex. The service of worship took place at the massive St. Columba CCAP, and lasted about 90 minutes. There was energetic preaching, dynamic singing, and most importantly the opportunity to see how a community gathered in support of a family immersed in grief. On a personal note, I was so glad to see many old friends at this funeral – an opportunity just to say “Muli bwanji?” to folks who have been an important part of my partnership experience over the years. 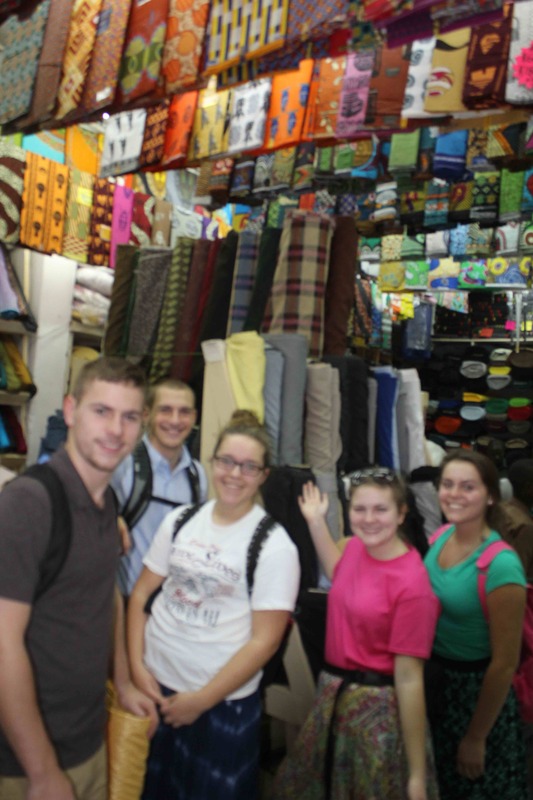 We left the church and visited one of the fabric merchants in downtown Blantyre. What we were afraid might be a cumbersome process of having the six of us agree on fabric for our clothes turned out to be, instead, a very pleasant and informative glimpse into that industry here in Malawi. 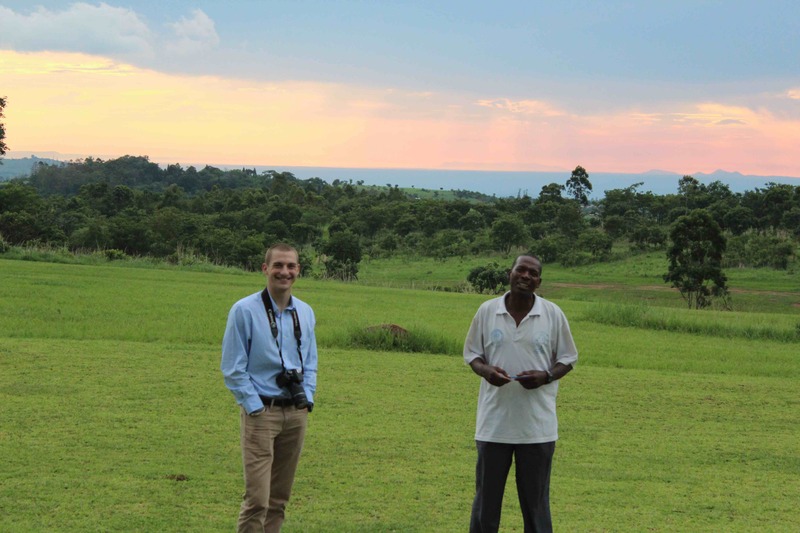 Our host and friend, Davies, had arranged for us to visit a small Eco-lodge located in Mvumbwe. Game Haven Lodge“ is a conference center/resort/restaurant/golf course that seeks to provide the opportunity for a small section of Malawi to be inhabited by many of the creatures that once roamed free across the continent. 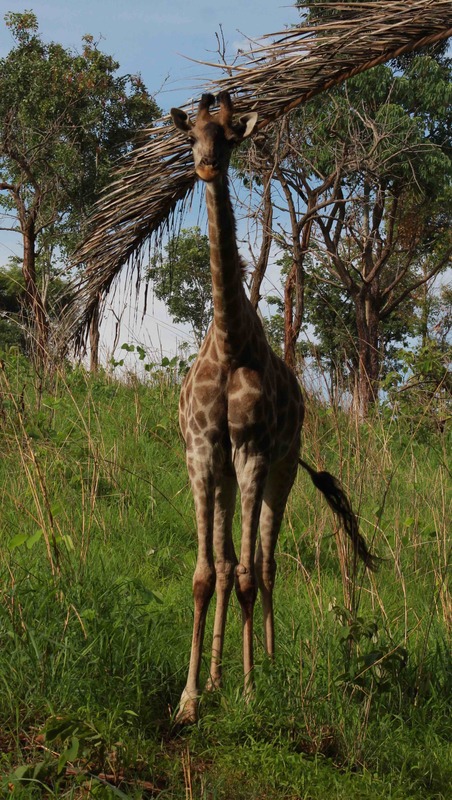 We were treated to a ride through many acres of Malawian countryside that is being transformed back into the bush… and on the way were privileged to encounter antelope, wildebeest, zebra, giraffe, and dozens of amazingly beautiful birds. We then enjoyed a delicious meal with an amazing view. Abusa Mbolembole joined us for dinner back at Davies’ home (if it seems to you like dinner was right after lunch, it seemed that way to us, too!). 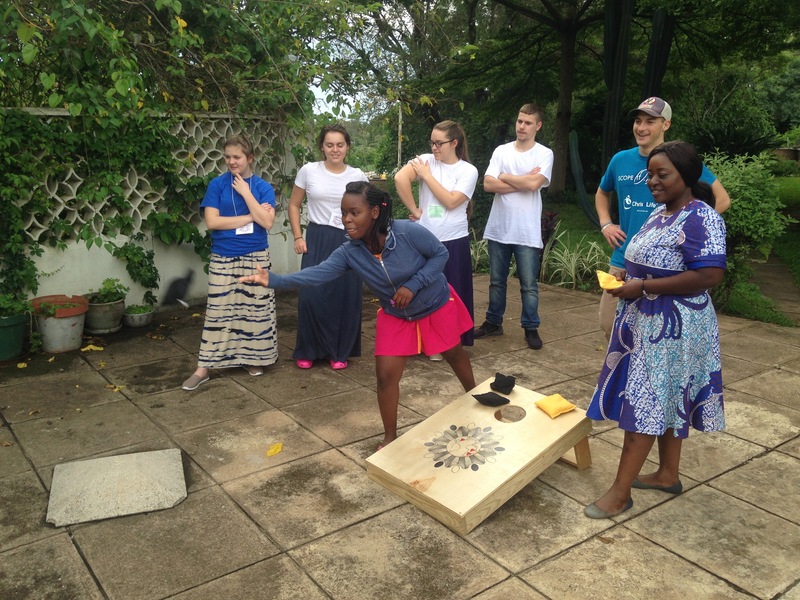 This gave us further opportunity to consider the role of youth in the churches in Malawi and in Pittsburgh. We wrapped up our day with a devotion (the team is taking turns leading these daily sessions) which evolved into a two-hour debrief of our experience of the intersection of our cultures and practices. What a rich time, full of laughter and questions and wonder. We looked at the photos we’d taken during the day and planned the events of tomorrow. I’m disappointed to tell you that many of the photos we took with people in them came out too blurry to use – but all of the images in this posting were chosen by the team, who wanted you to see a little of what we were able to see in our first day in Malawi. Thanks to you for your support and encouragement; thanks to God for making this experience possible. 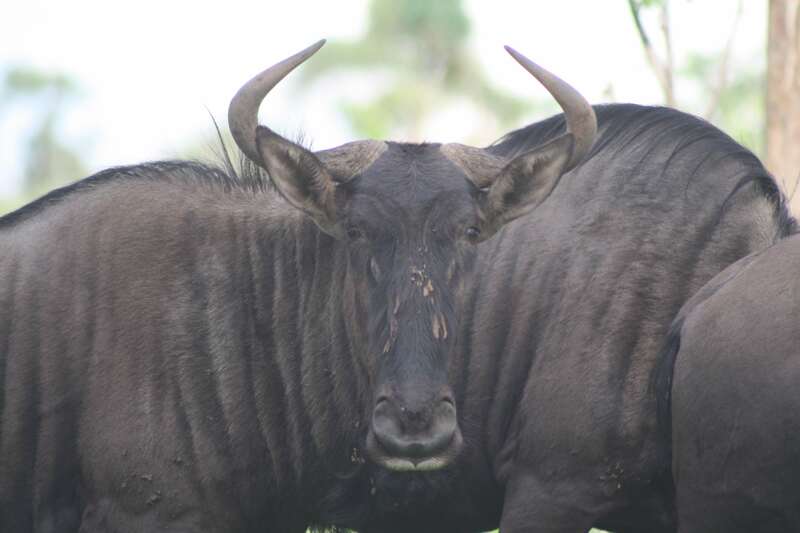 A Blue Wildebeest is ready for his close-up. 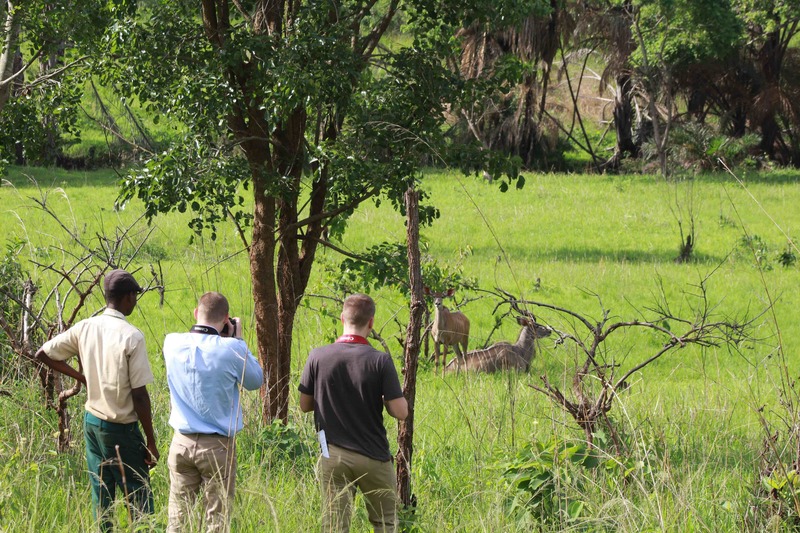 While we toured Game Haven in a vehicle, this was a chance for something extra for David and Joe – approaching a pair of Kudu on foot. 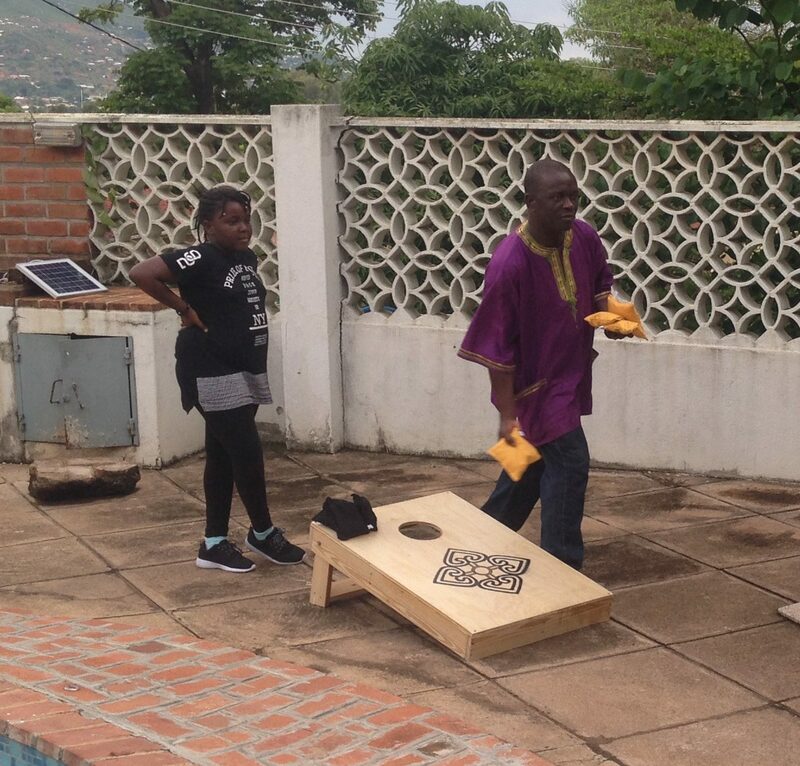 Gerard is a school teacher who has given generously of his time to help enrich our time in Blantyre. 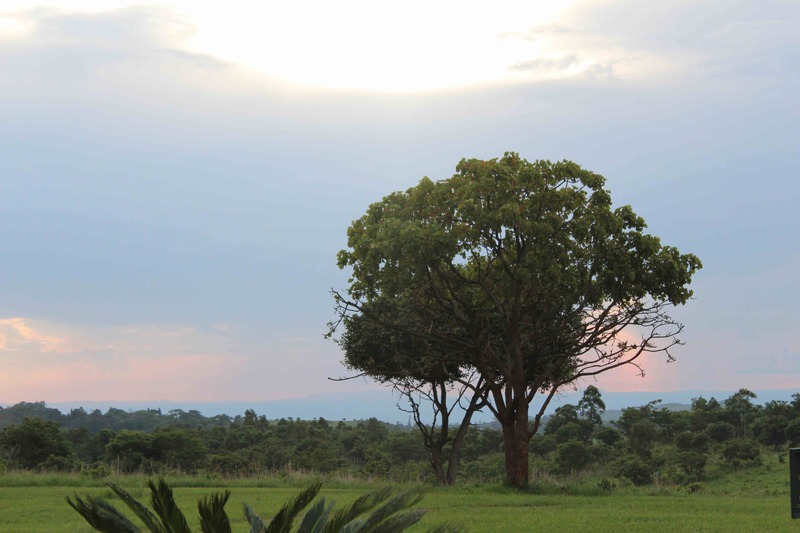 The African sky was changing all day – but always beautiful. A little down time while we wait for transport? Why not teach Davies how to play ‘Bananagrams’? God’s people in Crafton Heights are continuing to study the Book of Judges as a way of listening to how God comes to us in the midst of our brokenness. This week’s message provides the second introduction to the book as well as a challenge to care for our children well. 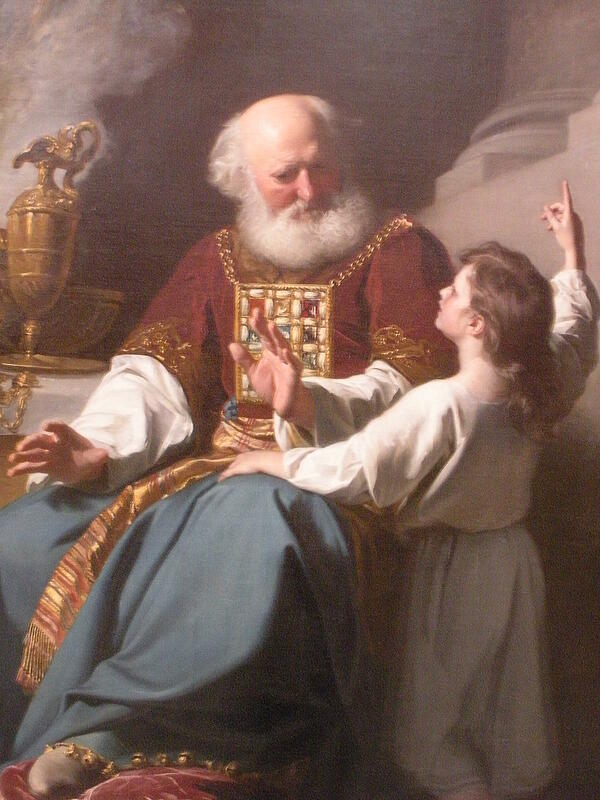 Scriptures include Judges 2:6-19 and I Peter 2:9-12. Yeah, well, OK, that’s a lie. Because, quite frankly, no one, ever, has asked me to talk with them about the Deuteronomic cycle. But maybe that’s just because while you have always wanted to see something like this, you never thought to bring it up in polite conversation. 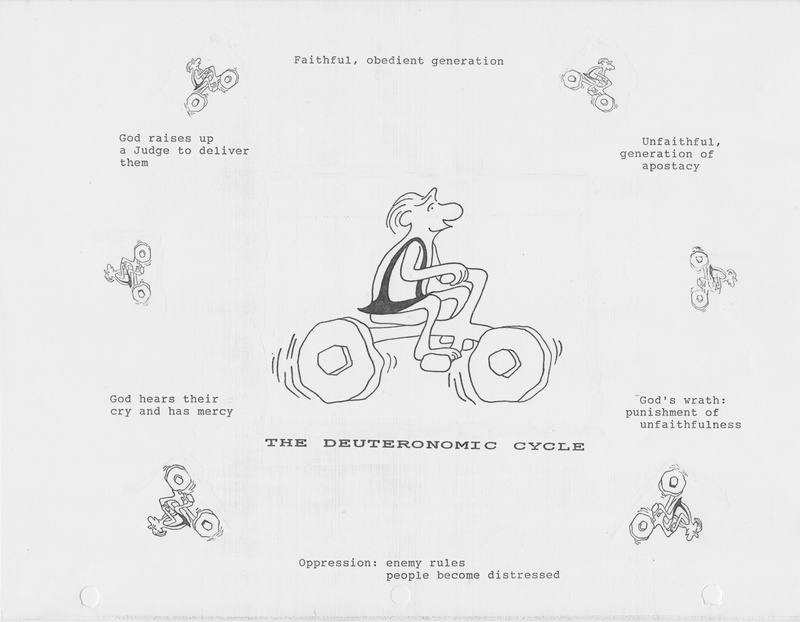 So today is your lucky day, because here is a representation of the Deuteronomic Cycle, one that was given to me by our friend Tammy Weins Sorge. The Deuteronomic Cycle is a term that is used to describe the theological history of God’s people during the time that the book of Judges was written. It’s a way to interpret the narrative that we’ll be studying for the next few months. 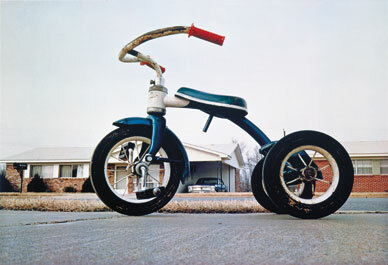 You can see how the cycle works – essentially, the people start off all right, and then they blow it somehow. 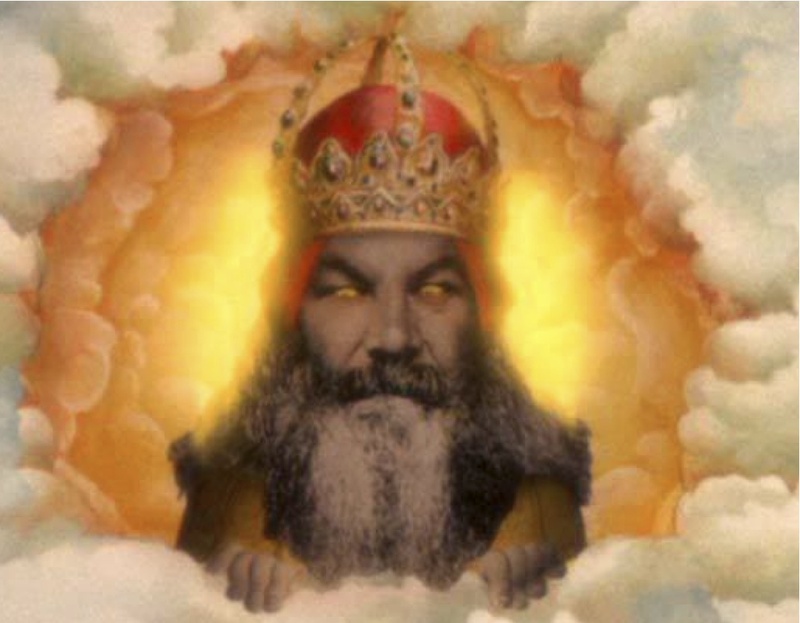 God gets really angry and then zaps them. The theological term for this is that “God’s wrath is unleashed.” The people suffer because God is so mad, and then they cry out to God. God hears them and cuts them a break by sending them a leader, or a judge, who sets things straight… until they screw up again, when he gets angry again, and so on. As I say, this is a time-honored way to understand the book of Judges. And it is essentially correct – at least in the cyclical nature of things. However, I’d suggest that we read the story this way because we’re the people. We believe that God did something to us, when in reality, it may have more to do with our own choices than we’d like to admit. Do you see? We find it very, very easy to minimize the effects of our own choices some times. I would suggest that in the book of Judges, we see a cycle all right – but instead of it being a cycle wherein God gets angry and punishes people for being so stupid, it’s a description of the truth that time and time again, humanity chooses poorly, and God allows us to experience the consequences of those choices. In this case, and in many, many places in the Old Testament, the decision that God’s people make is to forget about worshiping God and instead choose to worship the Ba’al and the Asherah, the gods that the Canaanites worshiped before the Israelites show up in the land. 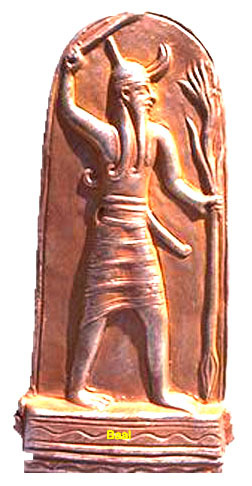 Ba’al is a fertility god, usually depicted as either a bull or a man with a lightning bolt in his hand. He is a propagating, inseminating, seed-spreading machine. 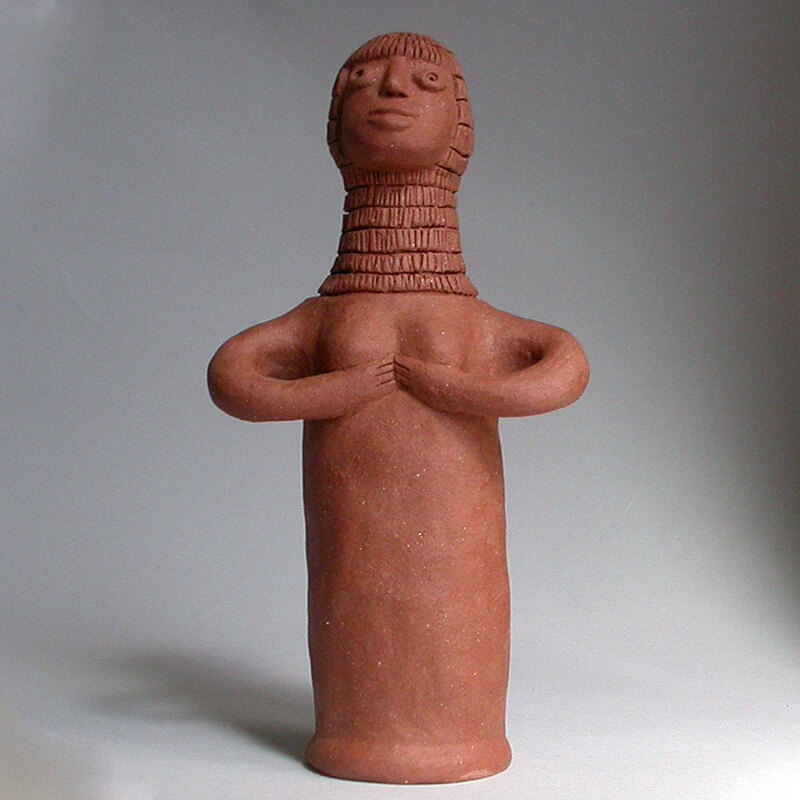 Asherah is his female counterpart, said to be the “Queen of Heaven”, and she was often worshiped at poles that were erected in her honor. The “worship” of Ba’al and Asherah almost always involved some sort of sexual activity on the part of the priests and the worshipers. It was, I must say, a very popular religion. And time and time again, the people of God, the people who ought to know better, choose to be fascinated with the allure of the Ba’als and the Asherah rather than to serve the God who called them from slavery. And here in Judges 2 we see a fascinating, horrible situation. 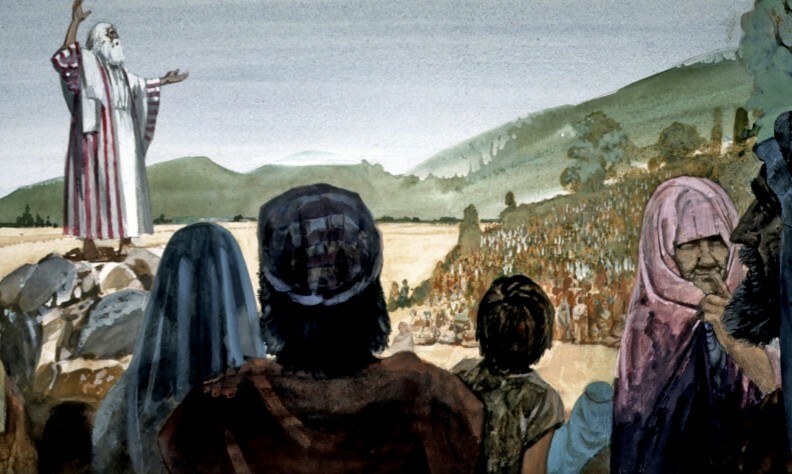 It’s a second introduction to the book of Judges, and we once again encounter Joshua giving the people their final instructions. Under the leadership that Joshua shared with Moses, the people have left Egypt and trekked through the desert for a generation. They’ve eaten manna, seen God at work time and time again, and crossed into the Promised Land. And here, before Joshua and his peers are cold in their graves, the people of God choose to abandon God and live, act, and worship like Canaanites. In the space of a few years, they’ve gone from being followers of God to acting as his enemies. How could this happen? Why did they make this choice? Last week, I mentioned what I thought was both the theme, and the saddest verse in the book of Judges: “In those days, there was no king in Israel, and every man did what was right in his own eyes…” (21:25) We talked about the fact that it is easy for us to behave as if there is no God, no source of authority. The people of Israel had done what God asked them to do: they entered the Land that he was giving to them… But they forgot who God was. They forgot who they were, and they forgot why they were. And these words which I command you this day shall be upon your heart; and you shall teach them diligently to your children, and shall talk of them when you sit in your house, and when you walk by the way, and when you lie down, and when you rise. And you shall bind them as a sign upon your hand, and they shall be as frontlets between your eyes. Don’t forget! Yet in less than a hundred years, the people of God did forget who they were. Of course they made bonehead choices! How could they choose wisely at all when they were operating out of a place of ignorance and mistaken identity? Beloved, can you see that this is where the Church in North America is heading today? In our own tradition, the Presbyterian Church U.S.A., the median age is 63. That means that half of the worshipers are older than 63. 80% of Presbyterians are over the age of 45. I came across a study of churches in England that sent chills down my spine. In that country today, 39% of churches say that they have no worshipers under the age of 11. None. 49% have no attenders between the ages of 11 and 14, and 59% report no participation at all by those between the ages of 15 and 19. Here’s another way to look at the people who are (or who are not) church in the United Kingdom this morning. And that, my friends, would be a mistake. Because we are the church. And the church is losing her children. We are creating a generation who does not know the power or presence of God. How is this happening? 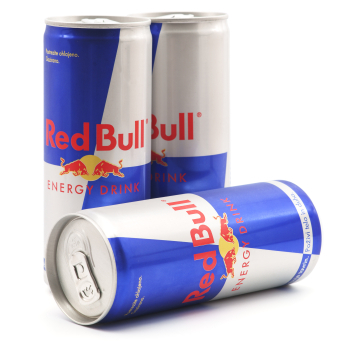 The folks at the Fuller Youth Institute suggest that one of the problems is that most churches today are giving their kids what they call “Red Bull experiences of the gospel.” Red Bull, as you know, is a drink that contains significant amounts of sugar, caffeine and other substances that will, its ads say, “give you wings”. That is, people who drink Red Bull find that they have a temporary burst of energy and effectiveness for study, driving, or whatever. Of course, that’s often followed by a let-down. A “Red Bull experience of the gospel” means that the church gives our kids an experience of faith that might be potent enough to help them make decisions at a high school party, but is not deep enough to foster long-term faith. This research hits me hard on a personal level. Because for the last forty-one years of my life, I’ve gone down to church on Sunday evening for youth group meetings. Thirty-five of these years, I’ve been a leader. 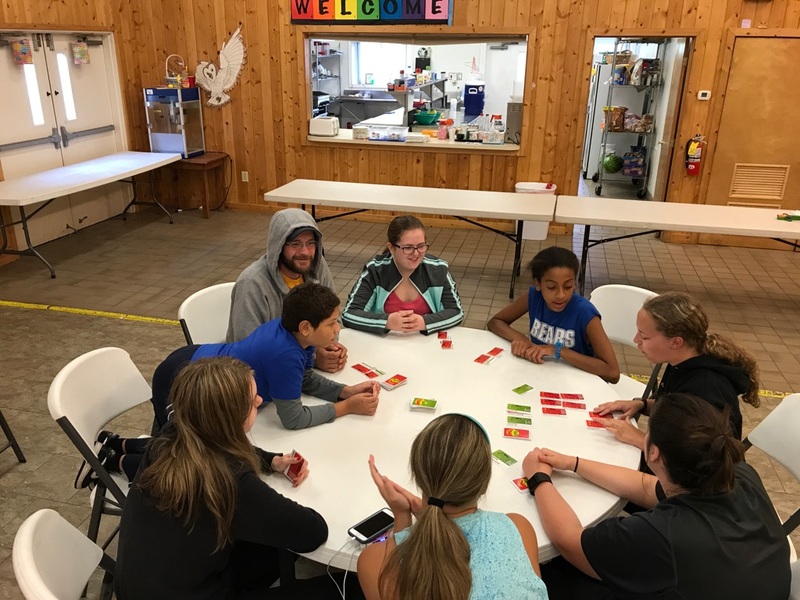 For a long, long time, I sought to connect with kids by making a splash, and by making Youth Group entertaining, relevant, and cool. And, I’m ashamed to say, I could get away with that thirty years ago. And I did. But now, whenever I see entertaining, relevant, and cool, well, it’s in the rear-view mirror. Any relationship I had with those qualities is in the past. And yet…and yet…I love children and young people now more and better than I did in the 1980’s. Beloved, here’s the thing that you need to know this morning: studies have shown that teens who have had five or more adults from the church invest in them during the ages of 15 – 18 are far less likely to leave the church after High School. Back in the day, I tried to be it for the kids that I knew. I played amazing games and was familiar with pop culture and tried so hard to make sure that every kid knew that I was there… And many of those young people are not interested in faith any more… in part, I’m afraid, because I tried to do everything myself. 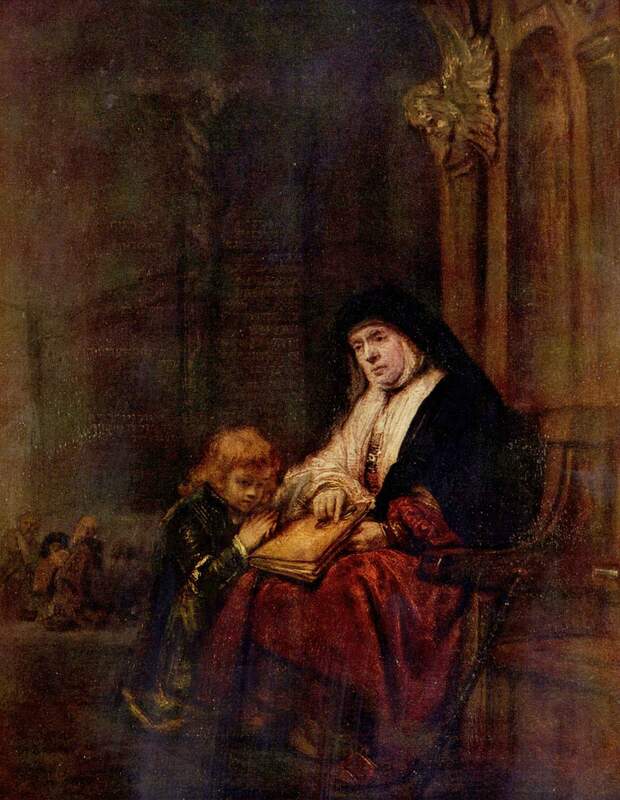 We need a culture wherein each of the young people whom we are called to love (which, I might remind you, includes all young people) are reminded of who they are according to the glorious truth of 1 Peter – that they, and we, like the first Israelites, are called into a place of blessing so that we can follow God in Christ so that the world might know God’s deep and rich love and blessing. Each of the young people we are called to love needs to be coached on making decisions and experiencing consequences and living into truth. What does that mean for us? Well, we have 27 children signed up in our Preschool program. There are an additional 27 students enrolled in the after school program with 5 on our waiting list. 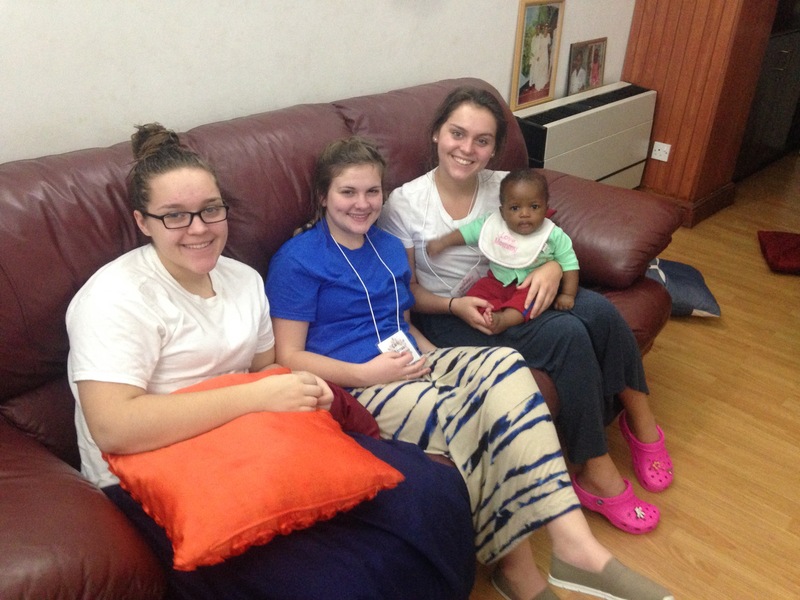 In the first two weeks, we’ve had 22 teenagers show up at our Sunday night youth program. If you’re doing the math that adds up to 81 children…not counting all the babies you see here. 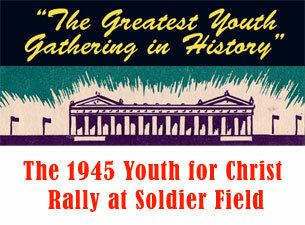 Where are the five for these young people about whom God is crazy and for whom Christ died? Which five people are seeking to somehow encourage, nurture, love, and build up each of those 81 children…and the others we know? Relax, people. I’m not trying to sign you up as a Sunday School teacher, a youth advisor, or a volunteer at the Open Door. Jessica and Jason might do that, and I think that some of you should, but that’s not my point. And don’t worry, I’m not trying to say that because I’m no longer entertaining, relevant or cool, you need to be those things to attract kids to Jesus. This is what I’m saying: I have come to understand that perhaps the most important thing I do in life is to try to confirm Christian identity in young people. To help them claim their heritage as being fearfully and wonderfully made; chosen by God for a future of grace and love, witness and service. I really believe that may be the most important thing I do. And I think I can be pretty good at it. Can we get off this thing now? But here’s the deal: like virtually everything else around this place, it doesn’t mean squat if only one person does it. The only way that this matters is if in some way, each of us is one of the five for some of the 81. Don’t come to youth group. But pray for these children. Don’t think you have to play dodgeball on Friday nights. But sitting here being glad that we have kids among us isn’t good enough, either. Can you engage, support, and encourage the young people you see, or at least the adults who are able to be in those relationships more actively? Maybe you can buy a pizza for someone who is working with kids, or babysit for free? How will you act and pray for the ability to see the children and youth in this community the way that Jesus does? 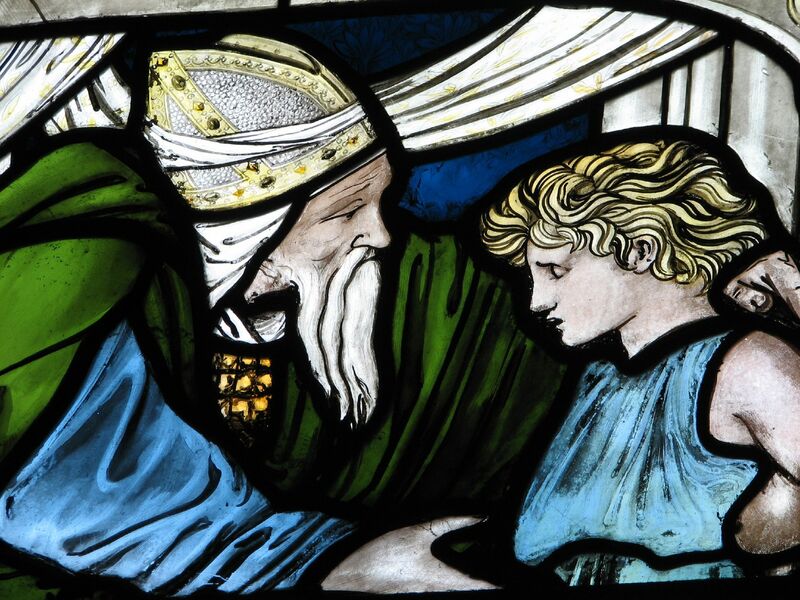 As far as I can see, that’s the only way to get off the Deuteronomic cycle in our own age – and in so doing, to raise a generation who is more faithful than we are. God hear our prayer. Thanks be to God. Amen.